An AC motor is an electric motor which is driven by an alternating current (AC) as opposed to a direct current (DC). AC is the form in which electricity is delivered to our homes and premises, DC electric current is delivered from a battery. The AC motor usually consists of two parts, an outside stationary housing which has coils in the form of a ring of electromagnets arranged around the outside (making up the stator), this is supplied with alternating current to produce a rotating magnetic field. The second part is an inside rotor, a solid metal axle, a loop of wire, a coil, a squirrel cage made of metal bars and interconnections, which is attached to the output shaft producing a second rotating magnetic field. Single Phase Induction Motors – including Single Phase Capacitor Start / Capacitor Run Motors and Single Phase Permanent Capacitor motors. 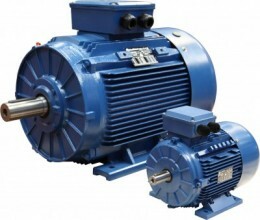 Three Phase Induction Motors – including Totally Enclosed Fan Cooled Motors and 3 Phase Explosion Proof Motors. If you can’t see what you are looking for or would like some advice or help, please call one of our dedicated team on 0117 955 2481.